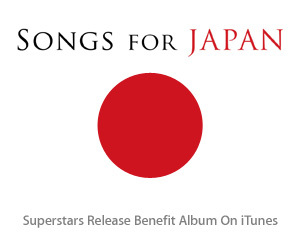 You can also support Japan relief efforts by purchasing the Superstar Benefit Album “Songs For Japan” from itunes. As Japan recovers from the devastating earthquake and tsunami that struck on March 11, the world’s top recording artists respond to the tragedy with this benefit album. The 38 tracks include some of their biggest hits, featuring an exclusive remix of Lady GaGa’s “Born This Way,” Katy Perry’s “Thinking of You,” Bruno Mars’ “Talking to the Moon,” Adele’s “Make You Feel My Love,” and more. All proceeds go to the Japanese Red Cross.